Every new Goldmund Suite is a breathtaking discovery, and the closer you can get to “live”. 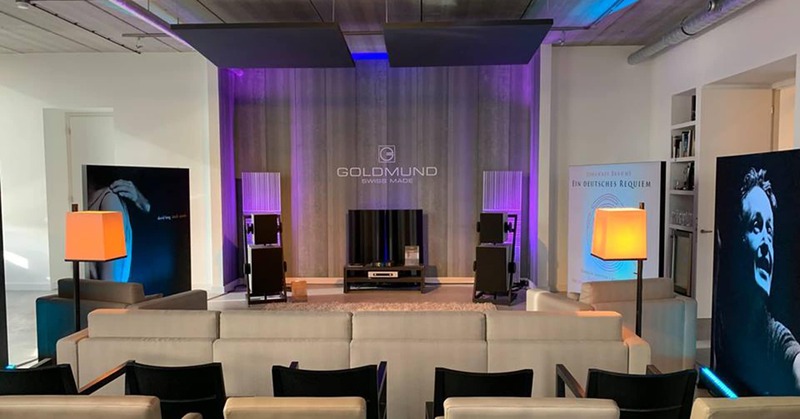 The journey takes place at PUUR Audio, Video & domotica showroom and offers participants an immersive musical experience powered by the unrivaled Goldmund Satya Stereo Sound System, snacks and drinks. Goldmund Suite first edition took place on 26 January 2019 and welcomed an album of Teis Semey released by TRPTK, and Maya Fridman live. On Sunday 24 March 2019, attendees enjoyed the second edition of the Goldmund Suite which covered “Death” in a light tone. At the agenda: Johannes Brahms album “Ein Deutsches Requiem” performed by Capella Amsterdam and the Orchestra of the Eighteenth Century; and David Lang album “Death Speaks” inspired by Franz Schubert songs. Lang collected texts from around 32 songs, including “Der Tod und Das Mädchen”, “Erlkönig”, “Die Schöne Müllerin” and “Die Winterreise”, to translate them into five beautiful almost supernatural new works. In these songs, death is given a face and lovingly sings to us about the world that awaits us after this earthly life. When composing, Johannes Brahms works entirely differently than usual with a Requiem. While Latin Death Mass accompanies the deceased and helps them achieve salvation, Brahms focuses on the relatives and offers them help and comfort to alleviate their suffering and make them accept the irreversibility of death. We look forward to the next episode of the Goldmund Suite. Keep track of future editions on our Dutch distributors Facebook Page, here.